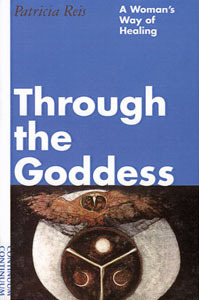 Drawing on her background in depth psychology, art, and archeology, Patricia Reis gives a unique feminist reading to the meaning of the Goddess. Through personal experience, women’s creative productions, and examples from the lives of women Reis has guided in her practice, Through the Goddess shows the in-dwelling Goddess to be a much-needed resource for physical, psychological, and spiritual healing. Reis is a proponent of feminist archetypal psychology, and presents in this work her thesis and the development of her methodology. Included is an analysis of Ken Kesey’s novel One Flew Over the Cuckoo’s Nest (Viking, 1962) and frescoes in the Villa of Mysteries at Pompeii. At the outset, she states that current images of goddesses are reworked through the patriarchal imagination, leaving women voiceless and seeking their own images and mythologies. Using pre-patriarchal goddess images, Reis shows us a more earthy, many-faceted goddess in whom creation and destruction, life and death are all contained–a figure closer to women’s experience of life than Greek and Roman examples. Recommended for most women’s studies or psychology collections. Because Reis’s skillful use of archetypal theory is evocative rather than dogmatic, this wise and gentle book is a healing work. Click here to see sample pages and order Through the Goddess at Amazon.